The Hunter Ceramic Heater features 2 heat settings with adjustable thermostat for you to easily reach your level of comfort. Unique oil-free technology allows you to feel the heat faster than oil filled radiators and enjoy safe, silent operation in your primary living spaces. Maximum safety with no risk of leaks plus built-in tip-over and frost and over-heat protection. Features a variable thermostat with On/Off switch and red light indicator when On. 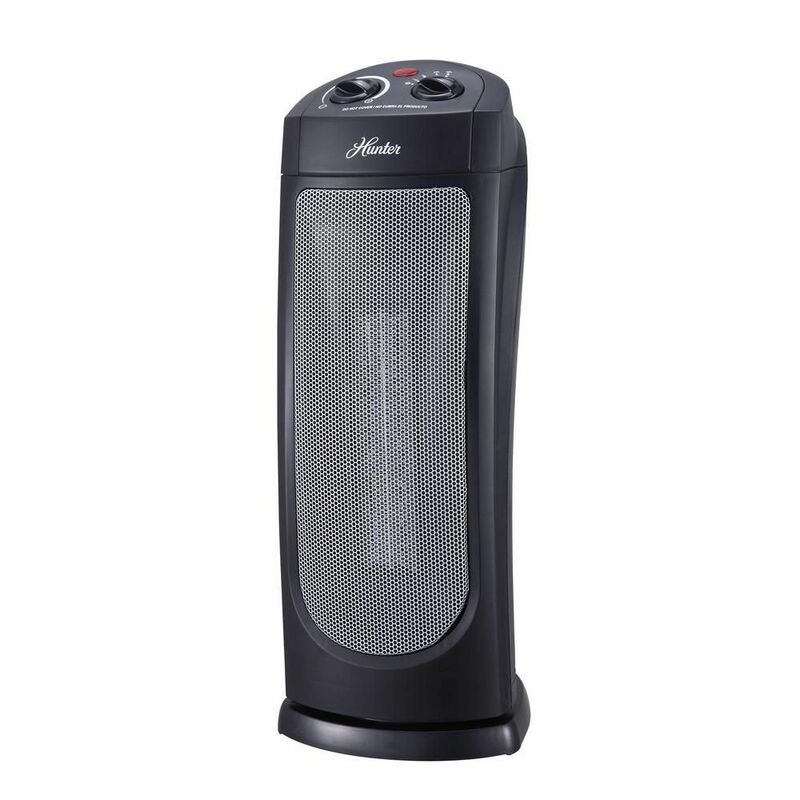 Oscillating Ceramic Heater with Thermostat The Hunter Ceramic Heater features 2 heat settings with adjustable thermostat for you to easily reach your level of comfort. Oscillating Ceramic Heater with Thermostat is rated 4.2 out of 5 by 647. Rated 4 out of 5 by Tony from This heater provided quite a bit of heat for its... This heater provided quite a bit of heat for its size! Rated 5 out of 5 by Maj from So far this is performing well in extreme conditions -... So far this is performing well in extreme conditions - a steel booth out on the airfield at a busy airport. But it has been only a few weeks since I bought it to replace a different brand (from Target) that gave up the ghost after 6-7 weeks, so we'll see with the Hunter. Rated 1 out of 5 by Frosty from It quit working after 4 days of very light use. Hoped it just needed time to reset its tip over s... It quit working after 4 days of very light use. Hoped it just needed time to reset its tip over sensor but no luck. When it did work it was ok but the fan was not very strong. This product is 120 volt. Is this product CSA approved? This model is cETL approved, complying to CSA Standards (C22.2). Please call 888-880-3267 if you have any additional questions. will this heat a room 143sqft? &nbsp;Also what is the range of the thermostat? I live in my RV (33 ft) and we are experiencing an early cold here. I need to heat at least 20 ft (160 sf). Is this one that will do that.